When the NCAA imposed heavy sanctions against the USC Trojans in 2010 after it was finally determined that star running back Reggie Bush received improper benefits while attending the university from 2003-2005, many were unsure how the punishment would affect the team’s future. Most programs cannot recover from a two-year bowl ban and the loss of 30 scholarships over a three-year period, but head coach Lane Kiffin has managed to lead the team to a No. 1 preseason ranking this season–just two years after the NCAA’s harsh ruling. With the Trojans now bowl eligible for the first time since 2010, fan interest is at a three-year high, which is reflected in home game ticket prices on the secondary market. As the Trojans continue to make headlines as the top team in the country, tickets to see Lane Kiffin’s squad are the most expensive in the Pac-12—averaging $129 on the secondary market. This is 23% more than last year’s season ticket price average and represents a 37% increase since 2010. 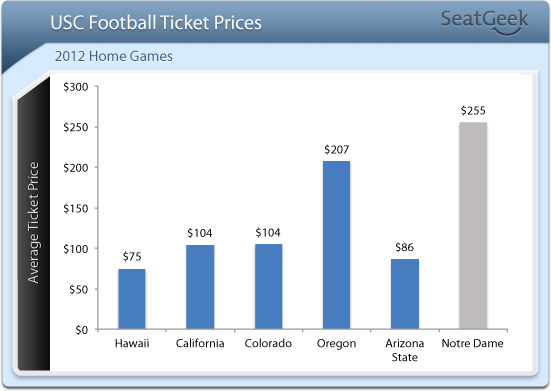 Not surprisingly, conference home games are also significantly more expensive than last year. Since 2011, tickets have become $22 pricier, jumping from an average of $117 to $139. This is due in part to USC’s highly anticipated conference game against the No. 5 Oregon Ducks, for which tickets are selling for nearly $207 across the resale market—making it the most expensive conference showdown since Lane Kiffin took the helm in 2010. While the matchup against Oregon is undoubtedly pricy, USC’s final home game against Notre Dame on November 24 is even more expensive, with tickets hovering around $255. Interestingly, the last time these two teams squared off in Los Angeles to end the 2010 season, tickets sold for nearly $100 less, averaging just $157.